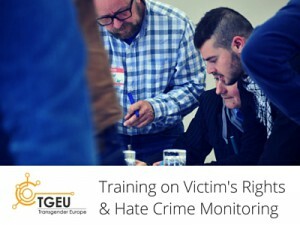 TGEU would like to invite participants from Europe and Central Asia to participate in a training on Victim’s Rights and Hate Crime Monitoring, which will take place from 29 April – 1 May in Berlin. This training is organised within TGEU’s strategic objectives for capacity building and in conjunction with TGEU’s ProTrans project. This training is being offered in response to a capacity building consultation that TGEU conducted with its members in 2015, in which transphobic violence, hate crime and hate speech were identified as the most important topic for capacity building support from TGEU. Trans people in many parts of the world have for a long time been victims of serious and repetitive hate crimes, including severe physical violence, murder and other forms of maltreatment. Although several activists in national and international contexts have reacted to reports of murdered trans people, for instance, launching the Transgender Day of Remembrance in 1999, there is only a limited number of initiatives aimed at systematic monitoring of hate violence. TGEU launched its Trans Murder Monitoring (TMM) project, a systematic collection, monitoring and analysis of reported killings of gender-variant/trans people worldwide in 2008. Between 1 January 2008 and 30 September 2015, the project recorded a total of 1,933 reported killings of trans people in 64 countries worldwide. In order to address underreporting of hate crimes in Europe, TGEU also works with partner organisations to record discrimination, hate speech and hate crimes and to offer community-based support for victims/survivors of violence in the framework of its ProTrans project since 2014. This training is particularly relevant for activists who have been or plan to be responsible for or involved with victim support, transphobic hate crime monitoring, documentation of human rights violations and violence, and/or advocacy within their organisation. • Attend the full duration of the training, i.e. arrive on 28 April and leave on 1 May (afternoon). TGEU will cover accommodation, per diems and travel costs for participants. Please complete the online application form by Sunday, 13 March, 24:00 CET. Participants will be informed of the outcome of the selection process before the end of March. In case of questions, please contact training@tgeu.org. This event is co-funded by the Rights, Equality and Citizenship Programme of the European Union, Open Society Foundations, the Dutch Government and the U.S. Department of State.